The engine running in 2012. 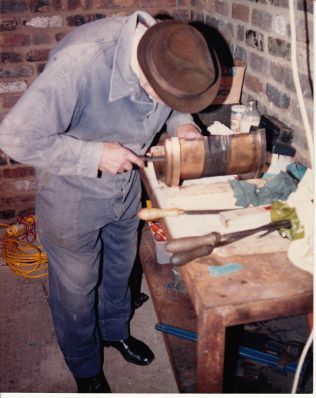 Jack Hobbs, scraping a main bearing in the 1980's. If you type ‘engines’ into ‘search’ above, you will get plenty of information. Fielding and Platt built a lot of engines! I am however, just going to give a brief history of the one at the Gloucester Waterways Museum. This engine, with a 14 inch dia. 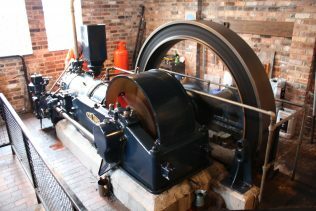 piston and 23 inch stroke, was built Circa 1929 and used to run a pattern shop and machine shop at Godwin Pumps, Quenington, near Cirencester, via an overhead line shaft 122 metres long. Belts and pulleys transmitted the drive to the various machines. During World War II, it ran a generator, again to provide power to the factory. It was last used in 1974, during the power cuts caused by the miners’ strike. The engine was then left unused and the factory had a catastrophic fire in 1980, which enveloped the engine as well. The Mid Gloucestershire Engine Preservation Society then decided they would like to restore the engine, if they could find somewhere for it. The Waterways Museum agreed to house it. Godwins kindly donated the engine to them and during the 1980s the engine was stripped down and gradually, items were moved to the Docks. This was quite a task, the Flywheel alone weighs 5 Tons! Foundations were prepared and the engine main castings and flywheel were mounted on them. The Engine House was then built around the engine, with the roof, I understand, being brought from Worcester by river. Jack Hobbs, a retired Fielding Engineer, helped with the restoration. He had actually serviced the engine during the 1930s! His knowledge must have been invaluable. The engine was finally started again in February 1988. Unfortunately, Jack Hobbs passed away just before this, so did not see the engine run again. 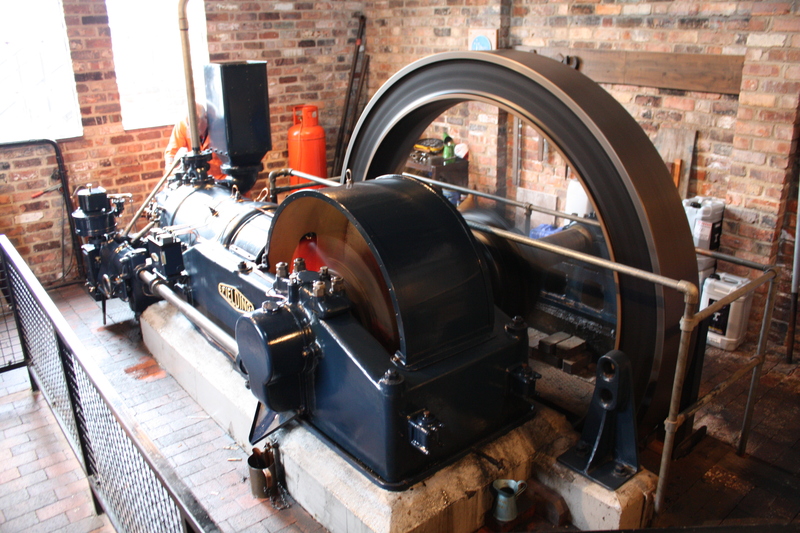 Today, the engine is still at the Gloucester Waterways Museum, but currently is in need of a new gunmetal main bearing, which has worn out after 84 years! In a way, the story is going full circle, because Godwin Pumps at Quenington have a very impressive factory and machine shop, with the latest equipment and they are currently investigating how to manufacture a new bearing. They have measured the old bearing and this is now on CAD. Trevor Hill (who has added information to this website elsewhere) worked on the restoration with Jack Hobbs and has found an original drawing of the bearing. Godwins now have a copy of this, to compare with their CAD drawing. The Museum was originally part of British Waterways and is now part of The Canal and River Trust (a charity). CRT could not afford to finance the new bearing, or a new relief valve for the air Receiver, which is used to start the engine, but such is the interest and enthusiasm of local people, that Godwins hope to finance the bearing and an individual, anonymous donor, will pay for the new valve. The cost of these items approaches £4,500. I hope to keep this page updated as things progress towards seeing, and hearing, the engine run again. It certainly draws the crowds when it does. If the people or places bring back memories, please share them by clicking on the words Add a comment about this page. Well done Trevor, long may she run! I am pleased to be able to report that after two years work, and with the help of Godwin Pumps, that the engine is once again running. It was first run on 10th January 2017 after a break of more than three years. 6th March 2015. Progress report. The latest on the engine is that the main bearings have all been spread on a mandrel manufactured be Godwin Pumps and they are now back in the bedframe. The crankshaft alignment has been checked and is satisfactory. Work has now started on the scraping of the bearings and when this is finished the alignment will be checked again. I will keep you notified as work progresses. January 2014. I thought I should provide an update on the status of the Engine. The Canal and River Trust who now own the Museum, have introduced new procedures and regulations. These changes mean that the work required to get the engine running again is being delayed. I first met Jack Hobbs in early 1983 when we took him to Godwin Pumps to have a look at the engine. Within 48 hours Jack had written the details of the dismantling and rebuilding of the engine and posted it through my friend’s door. It soon became apparent that Jack’s memory for detail was amazing because he had done this after a break of 50 years since Fielding’s had ceased engine manufacture. Jack had been a great help during the restoration and rebuilding of the engine. The last time that Jack was in the engine house with us was when we were fitting the breach to the engine and it came as a great shock when two days later we heard that he had passed away. The engine was first run on February 28th 1988, seven weeks after Jack’s death. Whilst we were rebuilding the engine Jack suggested that I start a register of what Fielding engines were still in exsistance either running, or not, and I am still doing this now.